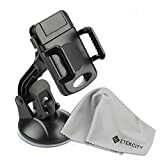 The Etekcity Universal Car Holder Mount fits most major cell phone brands, easily and safely. The mount has safety features to protect your phone from scratches when connected to the dashboard or windshield. The sphere socket of the device allows 360° of adjustment. Find the perfect viewing angle by freely tilting, turning, and swiveling the arm and grips. The car mount adheres to any stable surface without the risk or distraction of your phone being dropped from the mount grip. With the use of simple and dependable suction cup technology and gel adhesive, the phone stand is easy to dismount, disassemble and reassemble. The gel in the suction cup applies to both smooth and textured surfaces, like windshields or dashboards. Even on hot days or cold nights, using the locking foot on the device ensures your phone is secure. To remove the mount, release your phone with the release button, lift up the lever, and pull the tab up and the mount is removed with no mess! Just rinse the gel with warm water and let it dry. The suction will be back, good as new! Grip Width Range: 2.75 – 4.5 in. Suction Cup Diameter: 3 in.